What are your dinner plans for tonight? All this week I haven’t had my menu and completely forgot what was on it. So tonight I’m taking leftover chili and turning it into nacho beef soup. It’s easy, quick, and will be ready in minutes. 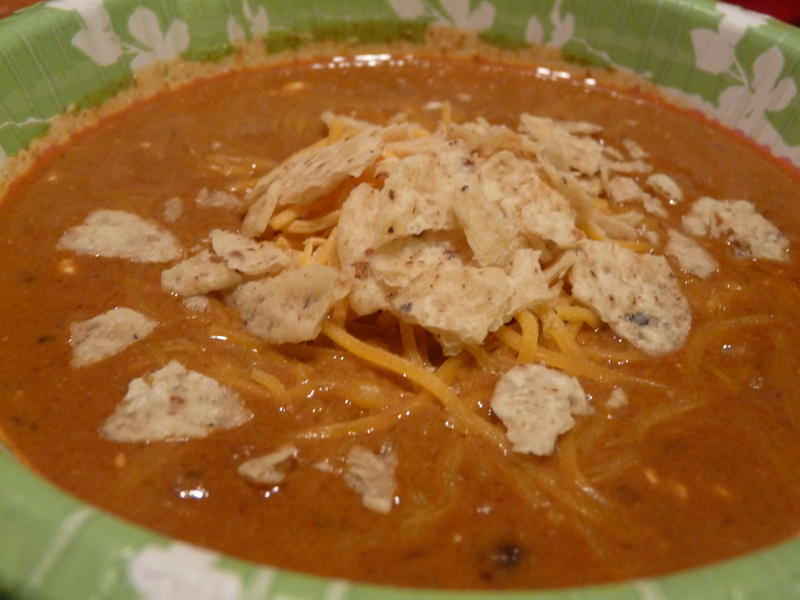 You can use any chili you have on hand, homemade or canned. Earlier this week I warmed up some of my Mom’s chili for the family. 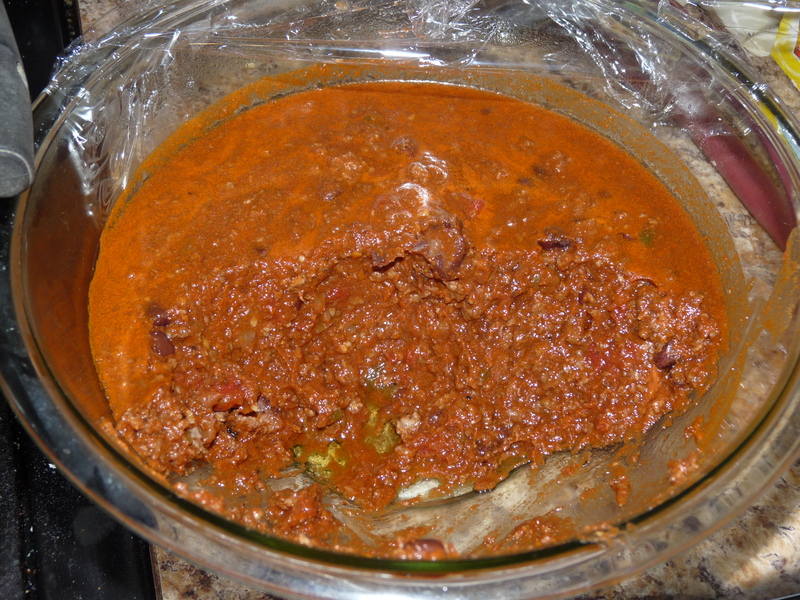 Last month she made huge stock pot worth of her homemade chili to which we froze half of it to keep for another meal. After heating it up for the family I still have half a bowl leftover. After deliberating with Mom about what to make for dinner she came up with the fab idea of using it as a starter for our nacho beef soup! So, I grabbed some leftover ground beef that I cooked up a couple of days ago, added it to a dutch oven soup pot with the chili, a can of black beans, two cans of beef broth, and a can of rotel. Cover and let cook for about 10 minutes. You’ll need to reseason with salt, pepper, chili powder, and some paprika as needed. You can also add extra diced onions and minced garlic if you like. Bring to a gentle bubble, allowing the seasonings to cook together. Add in 6 ounces of cubed velveeta and 4 ounces of cubed cream cheese. 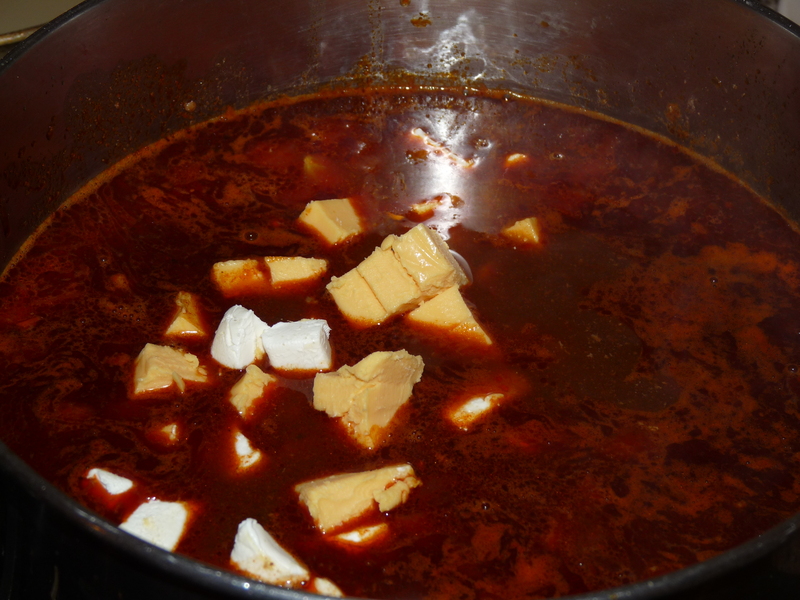 With a spoon or whisk, melt the two cheeses into the hot soup. Turn it down on low to allow the bits to finish melting. Just before serving take a whisk and give a final stir. You top this off however you wish, crushed tortilla chips, cheese, sour cream, raw onions. 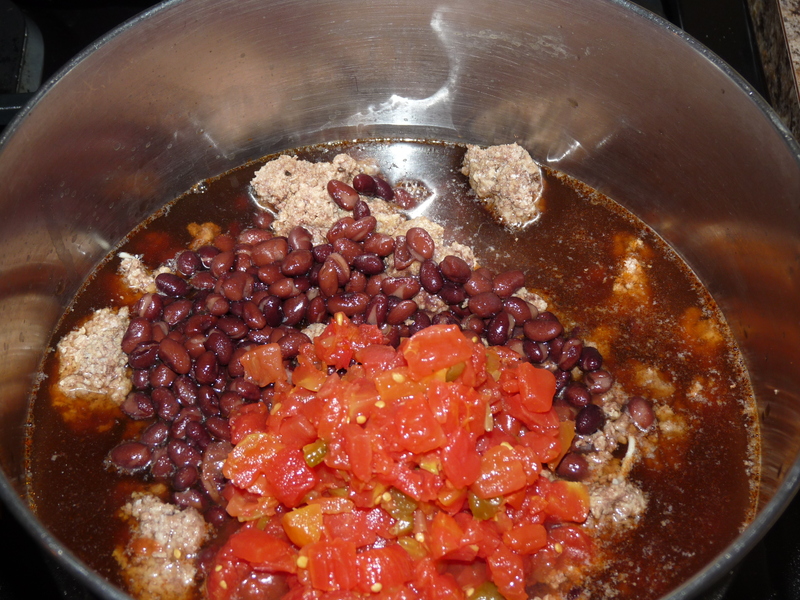 Into a dutch oven soup pot add ground beef, leftover chili, black beans, rotel, and beef broth. Let cook for 10 minutes to bring up to temp. Bring to a gentle boil and add seasonings as needed. Continue to cook over low/medium heat. Whisk in velveeta and cream cheese, cook covered and whisk again before before serving. 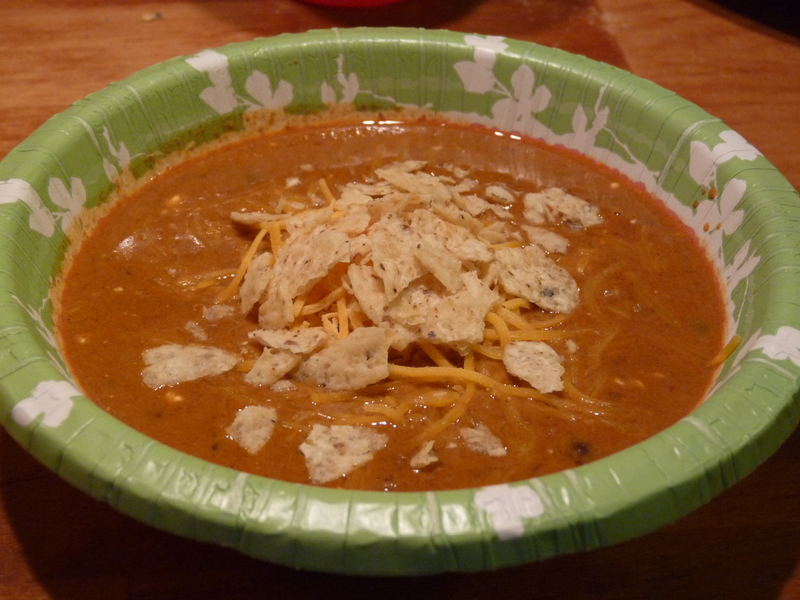 Garnish with shredded cheese and crushed tortilla chips. Morning all! If you’re oatmeal consumers then I’ve got a really good recipe for you 🙂 It’s simple, easy, took hardly any time to prepare and the best part is you can use any flavor of oatmeal you like! The downside(if there has to be one) you’ll have addictive cookies that are so hard to stop after just one…ok three…FINE six. Are these low carb? Pssh, nope not in the least. But then I didn’t make them for me so just file this recipe under “FOR KIDS” in your recipe binder 🙂 Plus this is a kid friendly recipe! Preheat oven to 350 degrees, prep baking pans with parchment paper or release foil. 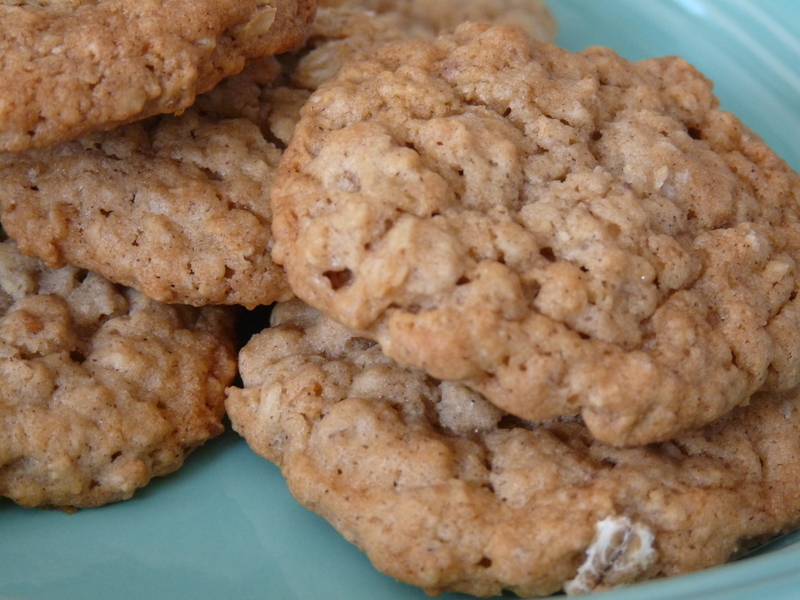 Mix all ingredients except oatmeal and flour. (I used a hand mixer to make sure the butter and egg was well blended with the sugars and leavening. With a silicon spatula or spoonula fold in the flour and instant oatmeal completely. 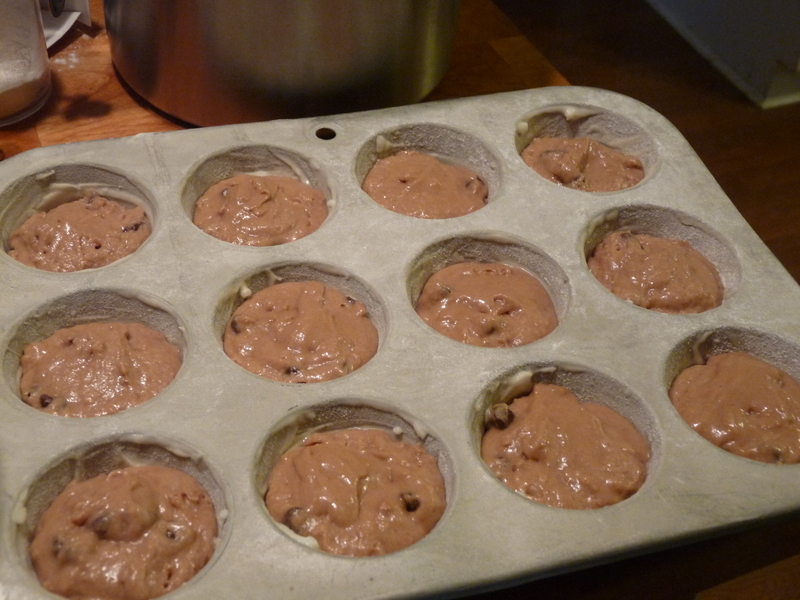 Using a 1 tablespoon cookie scoop, or a 1 tablespoon measuring spoon, scoop and form into balls. Flatten slightly and bake for 8-10 minutes or until lightly browned. Cool on pans for a couple of minutes as the next batch bakes, move to a cooling rack before storing. 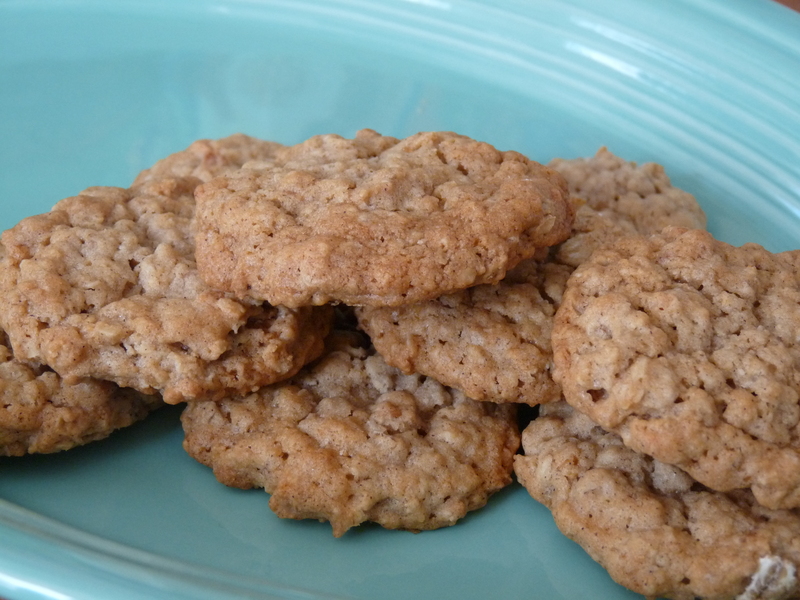 This recipe traditionally makes 2 dozen cookies, but I was able to get closer to three out of it. Afternoon everyone, getting back to a healthier lifestyle has been difficult for me. Especially with all this winter weather and single digit temps, I especially love creamy soups during this time and those are not always the best choices for me health wise. But my body is screaming for nutritious food and today I decided to listen to it. Choosing to eat the right foods that are not only good for you but will ultimately heal your body of ailments and aches can be difficult in the beginning. Sometimes it can be even harder to get back into if you haven’t stuck with it. This is why I have found a handy website called Heal with Food, there they have a list of 15 foods that help fight against the PCOS symptoms. 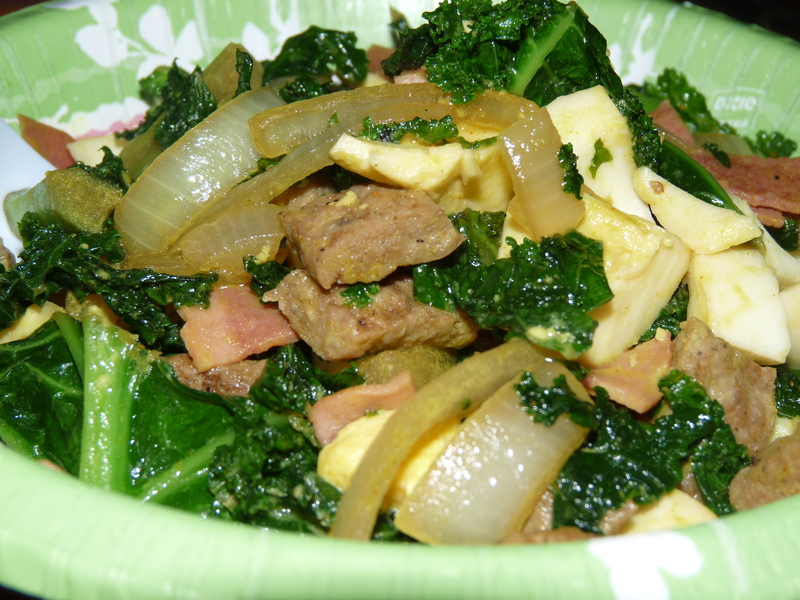 One such food I enjoyed today was kale and below I have the recipe for you to enjoy as well! One of the most interesting health benefits of kale is its broad nutritional profile. This nutritional heavyweight is loaded with a wide range of vitamins, and it is one of the best plant-based sources of calcium. Calcium is important for women with PCOS as it plays an important role in egg maturation and follicle development in the ovaries. The tender young leaves of kale can be eaten raw, for example as a substitute for iceberg lettuce in salads. This beautiful, green leafy vegetable can also be transformed into a hearty warm dish by sautéing the leaves and mixing them with chopped onions, crushed garlic and a little bit of extra virgin olive oil. When buying kale, it is advisable to choose organically grown produce whenever possible. According to research, conventionally grown kale is among the most contaminated vegetables in terms of pesticide and chemical content. In a saute pan add sliced onion, chopped turkey sausage patties and bacon with a little pat of butter. Cover pan with lid and cook over medium heat. Give a few tosses with kitchen tongs, add kale and cover again to cook till kale is cooked to desired doneness. Chop hard boiled eggs and add to pan, drizzle with soy sauce and sprinkle on some turmeric. Give a few more tosses to coat everything and allow the eggs to warm up. Serve hot! It’s not your typical wintery afternoon lunch, but it’s low carb, full of protein, calcium, and vitamins. You can add other vegetables such as radishes, carrots, celery, mushrooms, broccoli, and asparagus. Try adding kale to a vegetable and lentil soup, to casseroles, or take the young leaves and enjoy them on low carb sandwiches. Kale can also be added to smoothies (click HERE for recipes)! I know I feel better when I eat this way and the pounds do melt off. If you’ve never had kale before be sure to grab an organic bunch the next time you’re at the store. It’s a tad bitter but it’s not noticeable when paired with other ingredients. Hope you all are enjoying this Monday so far 🙂 I’ve got a quick and fabulous recipe that won’t kill your waistline or your blood sugar! For being thrown together in less than an hour this dish is great for using up any leftover chicken you have from a previous meal. In medium soup pot melt butter in olive oil and saute mushrooms, onions, celery, and garlic till completely cooked through. Add chopped grilled chicken. Pour in heavy cream and add cream cheese. 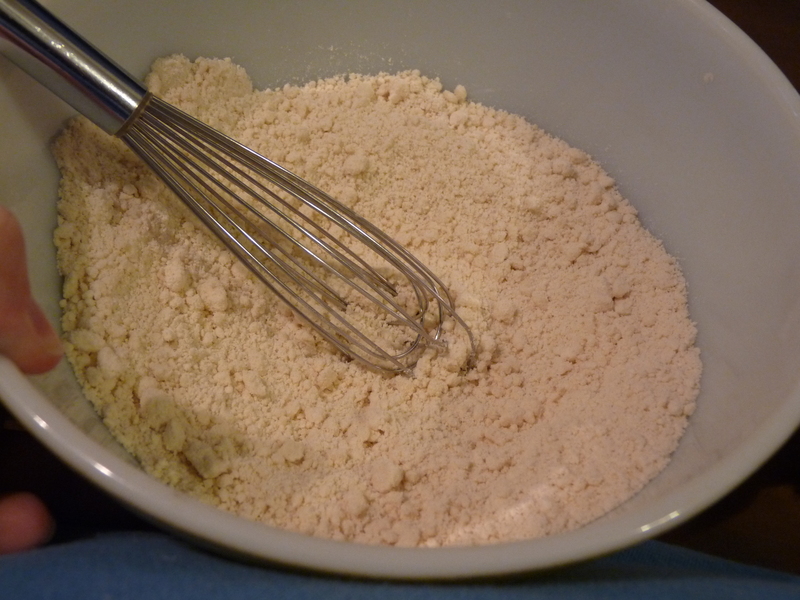 Whisk to help break down the cream cheese, then whisk in parmesan cheese and flour. Cook till thickened, season with salt and pepper and serve over favorite pasta. I served this over Dreamfields Angel Hair Pasta @5 net carbs per serving for a total of 13 net carbs combined. The carbs in this dish are drastically less than those I’ve Binged previously. Those carb counts range from 30 grams to over 80 grams. 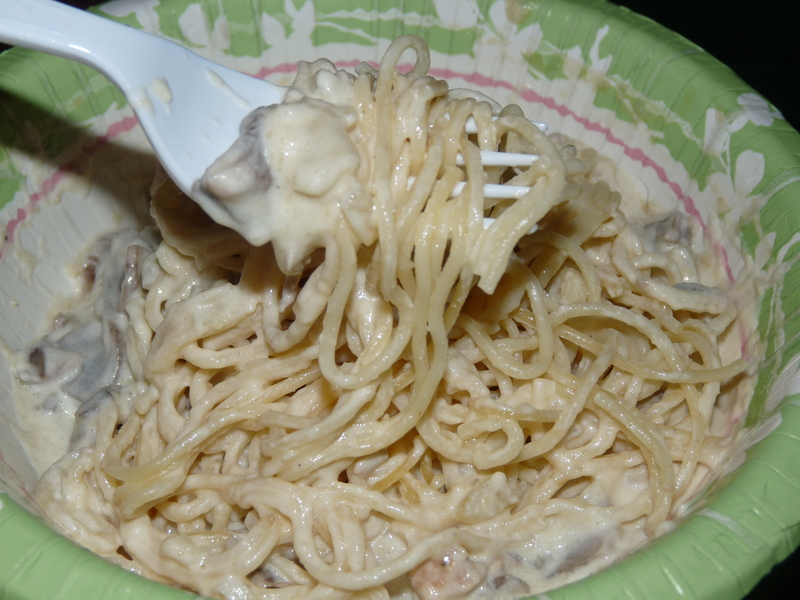 And I was shocked that one of my old favorite chicken and mushroom alfredo recipe that I used to fix has over 1000 calories per serving, therefore I can’t squabble about the 603 in this one 🙂 However, you can use half n half instead of heavy cream, less butter and cheese if you prefer. Pair this with a salad and garlic bread (use low carb with high fiber) to complete the meal. …with endless possibilities! I had some leftover chicken in the fridge and no idea what to do with it. Shocker, I know, but the weekend came and I was in the mood for mexican but beef is not my friend. 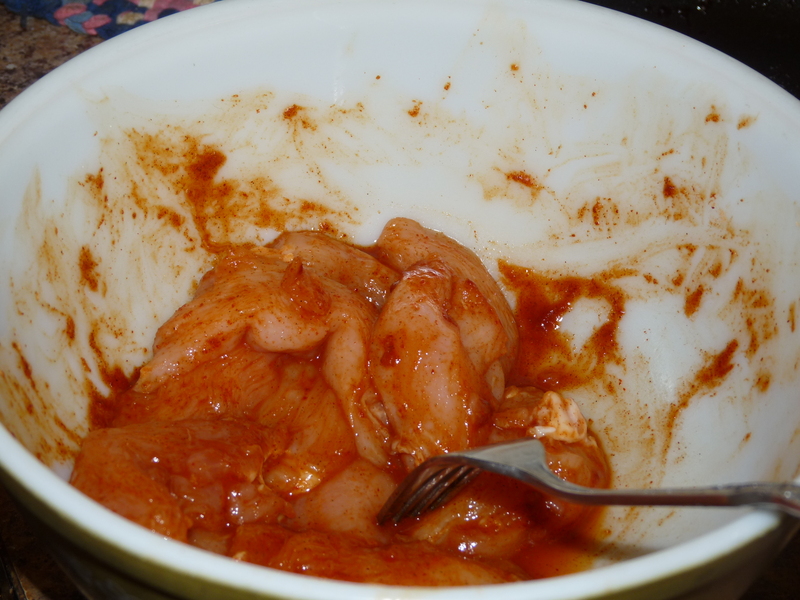 So I decided to make a very simple chicken fajita for dinner. First start with sauteing a large onion, lightly seasoned with salt. Cook till they’re transparent. Keep warm on the side. 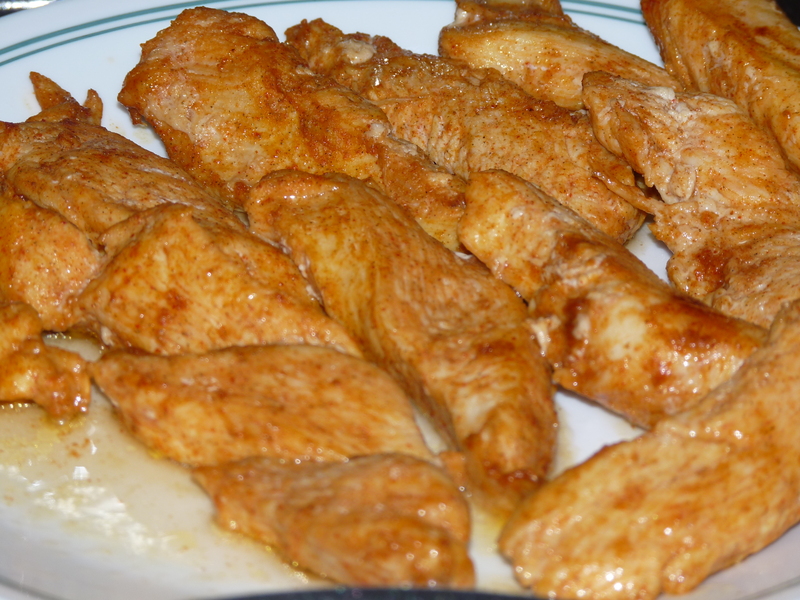 Slice up 6 small chicken breasts, add a pinch of salt and one entire package of taco seasoning. Toss it around making sure each piece is coated evenly. 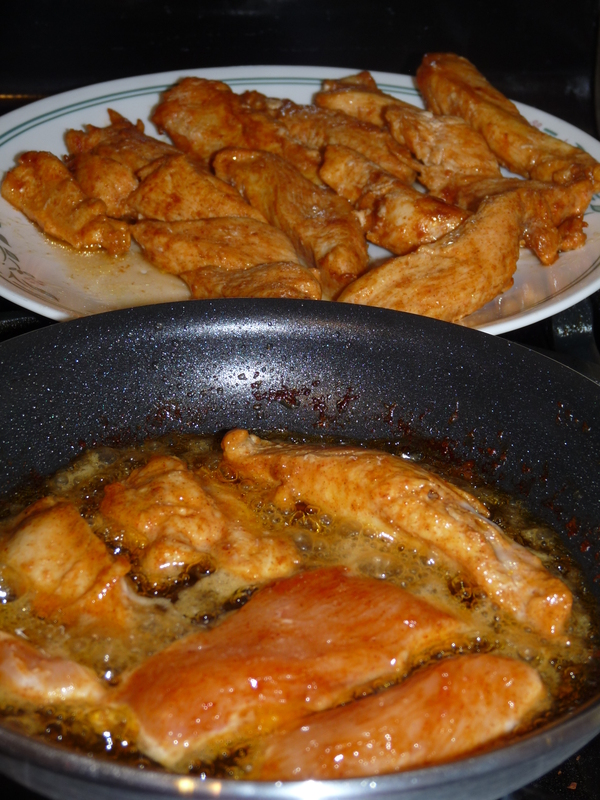 Then in large skillet with vegetable oil, cook up the sliced chicken over medium heat. You can serve this over a salad, in tortillas with cheese, onions, peppers, and guacamole, in crunchy taco shells, or just as is like G–Man did…eat it plain. Leftovers are great the next day or keep in the freezer for another meal. If you make extra, shred the chicken for chicken enchiladas. Here’s a quick variation of an old family favorite! If you have 15-20 minutes to cook then this is the recipe for you. 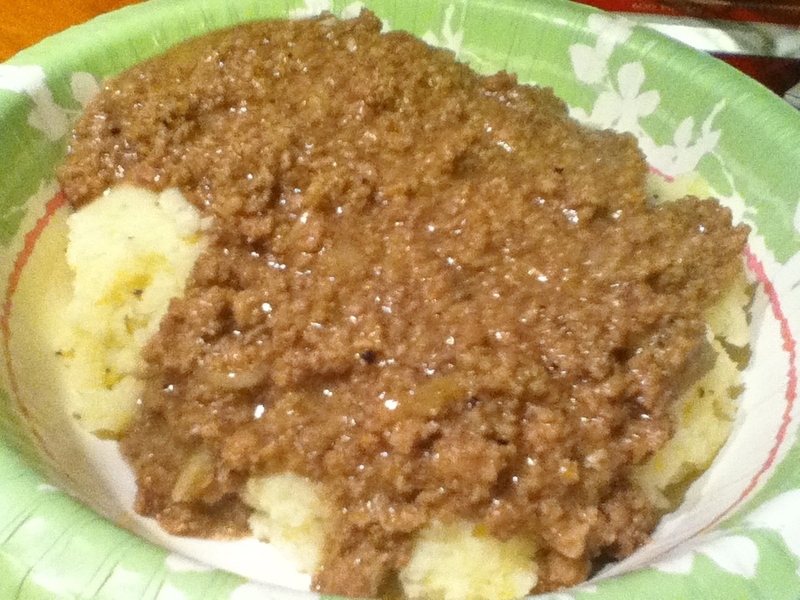 The key to it is using precooked ground beef, this will cut down on your overall cooking time. Very simply, add lipton onion soup mix to cooked ground beef. Pour in beef broth, add chopped mushrooms and minced garlic. Let simmer for 10 minutes. 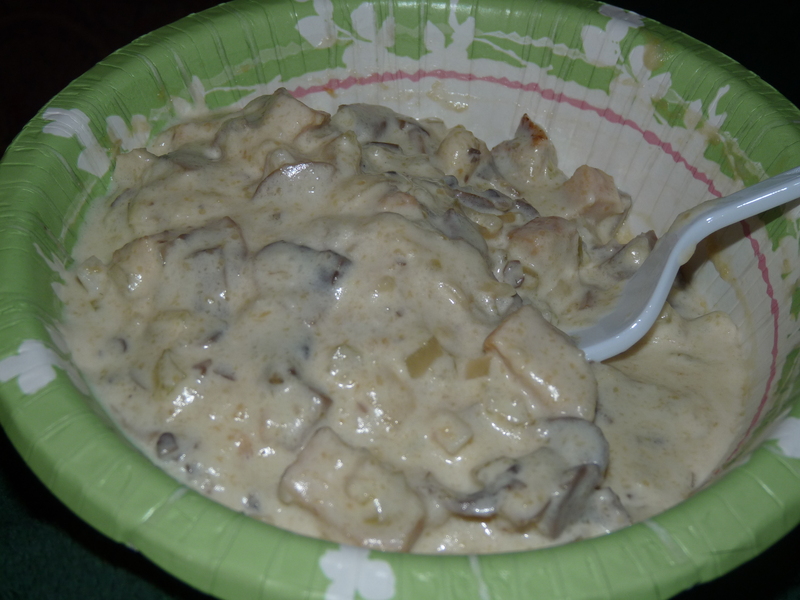 Stir in cream of mushroom soup and season with salt and pepper as desired. Leave the lid off and let reduce for another 5-10 minutes. Serve over mashed potatoes, fauxtatoes, egg noodles, or rice. Pair with your favorite vegetable, ours is corn, and salad. It’s a quick meal without all the pomp and posh of forming patties and making sure you have a pot big enough cook them in. A small dutch oven pot is plenty big for this version. I tell y’all what, you all certainly keep me on my toes 🙂 Last night just as I was having trouble going to sleep my ipod dinged with an update on my WordPress app. To my surprise, which kept me awake a bit longer hehe, I discovered that I was nominated for a Shine On Award! Jhuls over at thenotsocreativecook blog was so gracious to think of my humble blog and nominate it for this sweet award 🙂 Jhuls has so many fabulous and tasty recipes, one that has been tempting me for a while now are the Red Velvet White Chocolate Chip Cookies which I am finally going to make for Valentine’s Day this year! One of the requirements of this award is to share seven random things about myself. So here goes! I love Samba dancing even though I only do it at home 🙂 I’m not a great dancer but it’s the one style that I don’t mind gettin’ jiggy with! I always go to sleep on my left side to help keep my stomach acids down. This has helped me for months now, no more sleeping upright or munching on antacids before bedtime. My ipod is my alarm clock and I have to listen to soft music to help me sleep. Mostly mellow cello and mellow piano through the Songza app. My favorite bad snack, that I haven’t had in YEARS, would be Sun Drop soda and funyuns! I love psychotic and thriller movies, I love the suspense and hate the chasing scenes. One movie that still gets to me is The Strangers. That sensation that someone could be behind you watching you and you turn around to see that no one is there…freaky! We have a glass paned back door that I can’t wait to change to a solid door. If you’ve seen that movie you’ll understand why! I love listening to Christmas music through out the year. Mostly instrumental classical versions though. Share seven random, interesting things about yourself. Nominate up to 15 bloggers for the ‘Shine On’ Award, provide a link to their blogs in your post, and notify them on their blogs. If you have a child who absolutely loves helping you bake then this recipe is right up their alley! I found the recipe on the Cheerios website. 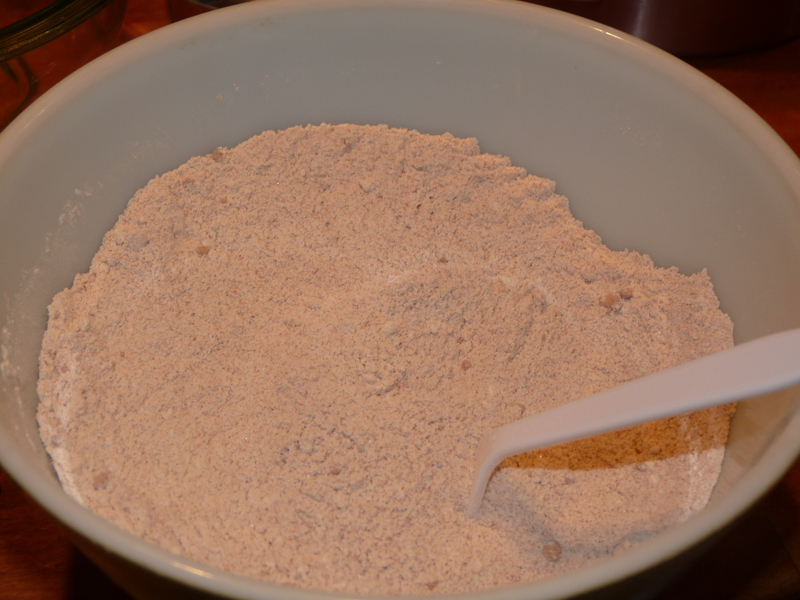 It’s a simple recipe, tasty, and the kids can get in with their hands to mix the dry ingredients in with the wet. The only addition I made was add 1/2 cup mini chocolate chips and reduced the golden raisins from 1 cup to 1/2 cup. These reminded me of cowboy cookies except for the addition of peanut butter and cheerios. Have fun baking!! Preheat oven to 375 degrees. Line multiple baking sheets with release foil. Bake 13 to 15 minutes or until golden brown. Let stand 5 minutes before removing from cookie sheet. Store loosely covered. Success Hint: It’s important to let these cookies cool on cookie sheets before removing–they can easily break into pieces while warm. These were super easy to put together. G–Man even helped with the hand mixing the wet ingredients. With a little guidance and instruction to keep the hand mixer level he did very well! 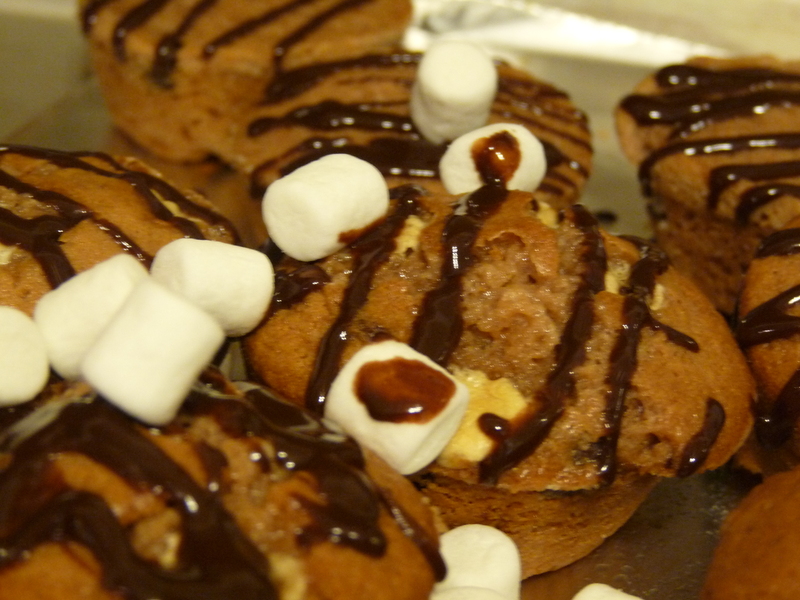 The mini chocolate chips were our addition to this awesome recipe. Plus we chose to go with 1/3 cup portion per cookie which gave us 18 cookies total. 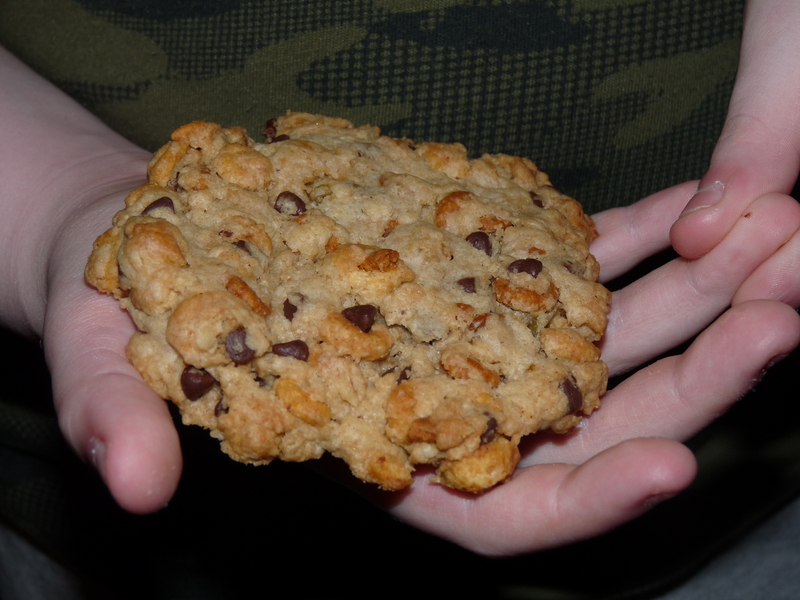 On a toaster oven pan I could fit about three cookies easily. On our 12–inch pizza pan I could get four cookies on it. The baking time was a little off for our toaster oven, even the temp was too much. I had to reduce it by 25 degrees and reduce the baking time by two minutes. If you know your toaster oven/oven bakes hotter then make those small adjustments before baking and you’ll have amazing results! These are a fiber packed cookie, take care when eating them. One cookie was almost too much for me. 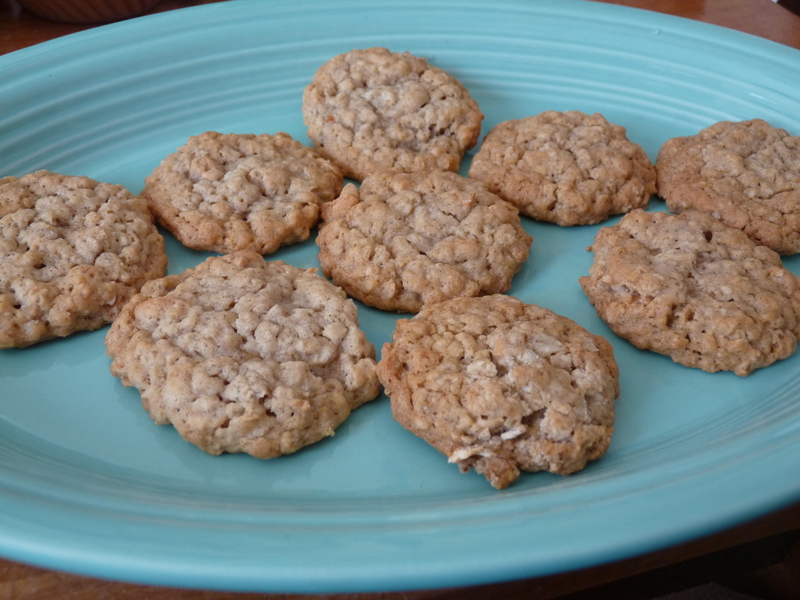 When I make mini cowboy cookies I can handle about 1–2 cookies (I use a 1/8 cup per portion). 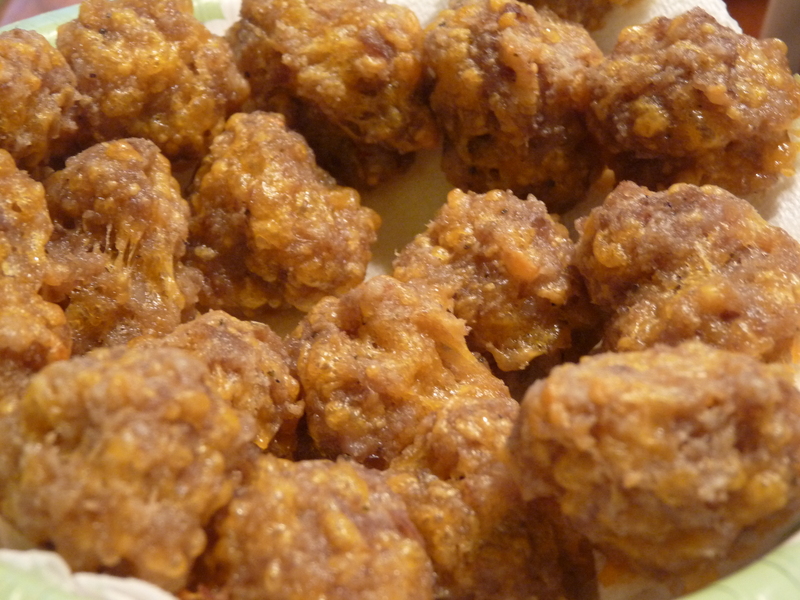 They are very yummy and so addictive! Eat with caution 🙂 Plus these cookies are great for on the go! Grab a serving of milk and it’s an instant quick breakfast. They are hearty enough to hold you over till your morning snack or lunch. Yesterday was a productive and mentally exhausting day. The cherry on top was finding out that one of my Pinterest posts had been re–pinned 100 times! That really made my day and in honor of that popular NOK(Night Owl Kitchen) post I decided to do a variation of it. You can check out the popular NOK Pinterest post here. I can’t thank you all enough for sharing that post, it’s been exciting for me to watch it being shared nearly multiple times a day 🙂 And I hope this variation will be just as popular!! It’s such an easy recipe you’re going to be kicking yourself for not having thought of it before (I know I was). Plus making it yourself you’re able to bypass all those unwholesome ingredients that are found in the store bought Bisquick. 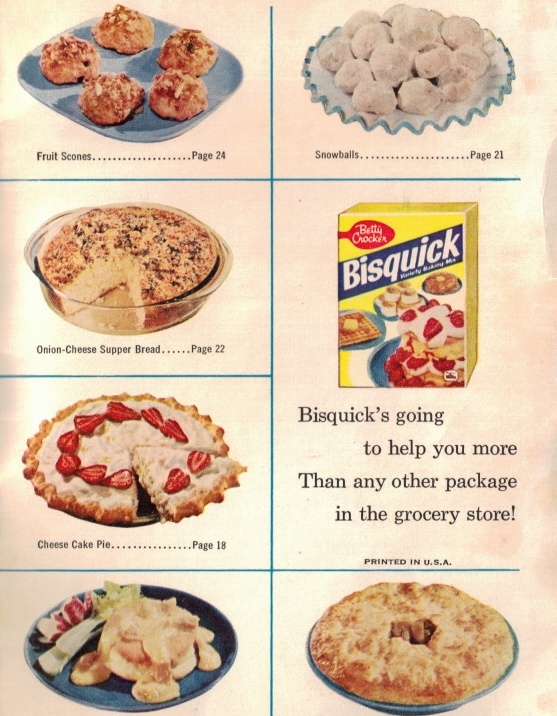 Did you know that there’s aluminum in Bisquick? We know that it’s not good for us yet we’re willing to use it because that’s what a recipe calls for or it’s quicker than making it from scratch. But it’s not healthier, it can lead to serious health issues and making such a simple mix from scratch will actually save you more money and be better for your health overall! Just looking at the picture it doesn’t seem any different from the store bought stuff. 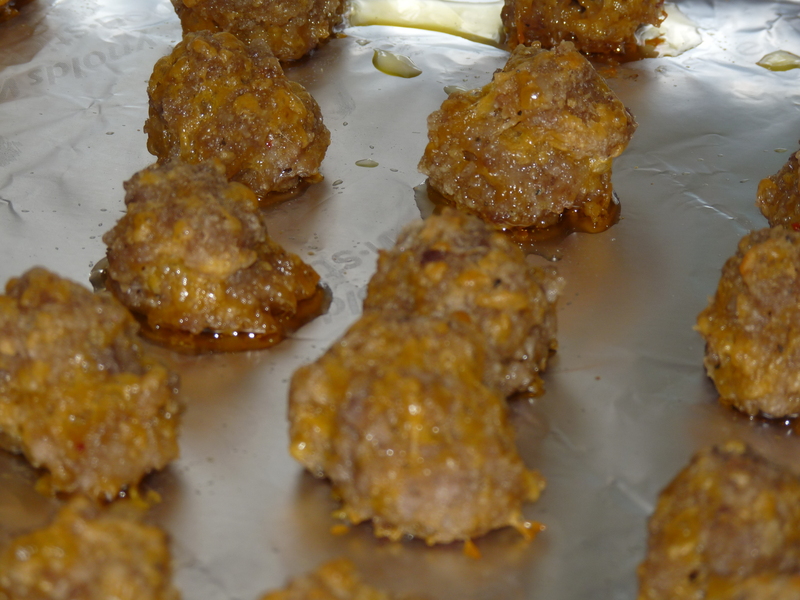 But the results of my homemade sausage turkey balls were 100 times better than I thought it would be! Whisk together the first three ingredients. With a pastry blender, cut in the vegetable shortening until it looks crumbly (refer to above picture). Store in an airtight container in the fridge for up to 4 months, or store in freezer safe bags(2 cups per bag), labeled, and freeze until needed. See…simple! Now on to an even better recipe, ready?! Mix together all ingredients in a large bowl. Line several baking sheets with release foil. 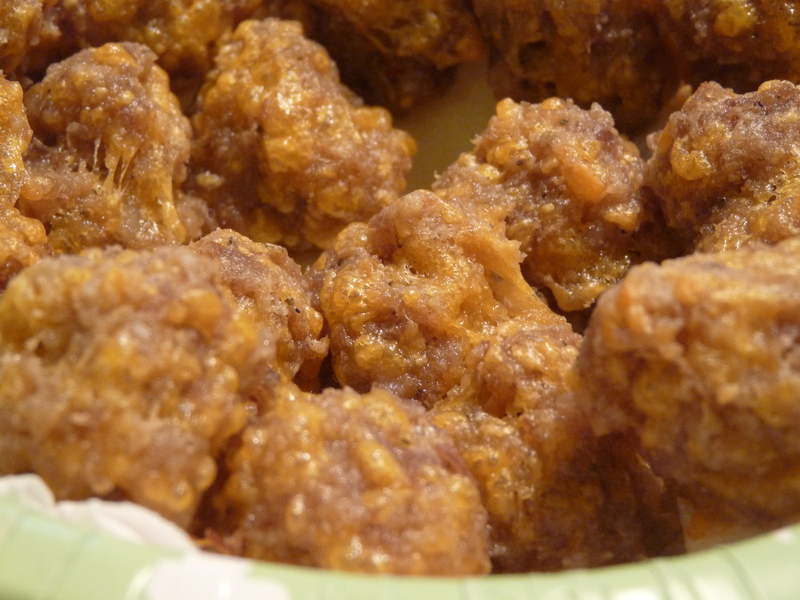 Using a melon baller or other small scoop dole out sausage turkey ball mixture onto each pan. Bake for 10–12 minutes, drain on paper towels before serving. These came out perfect! Tender, juicy, softer than the ones I grew up with. I hope I’m not the only one who’s still struggling to get back into a regular schedule. Monday proved to be a slow and trying day. 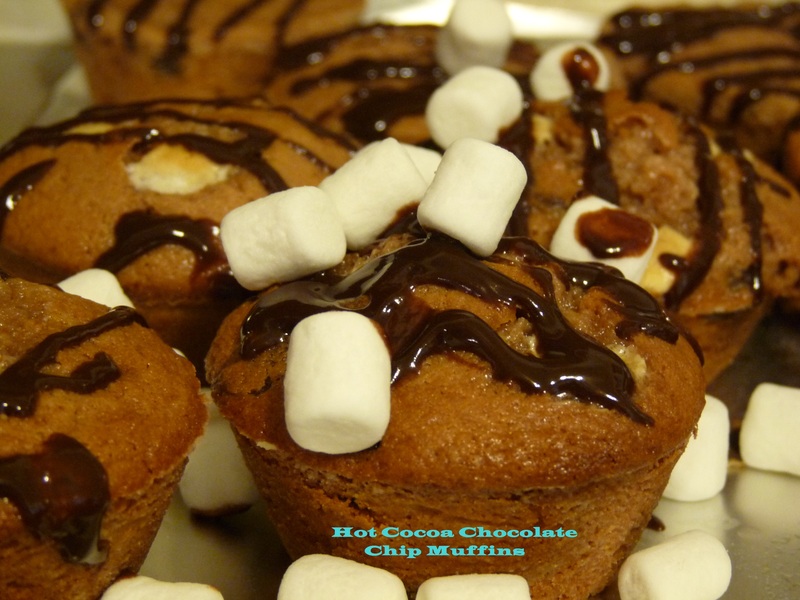 Must have been the rain 🙂 To make things better, I whipped up a batch of hot cocoa chocolate chip muffins for G–Man to make it seem less blah. This was an easy recipe from start to finish and tasted even better than I imagined! I looked around for some inspiration and decided to just go with a few ideas. Very simply, mix the dry ingredients, chocolate chips included. Set that aside. 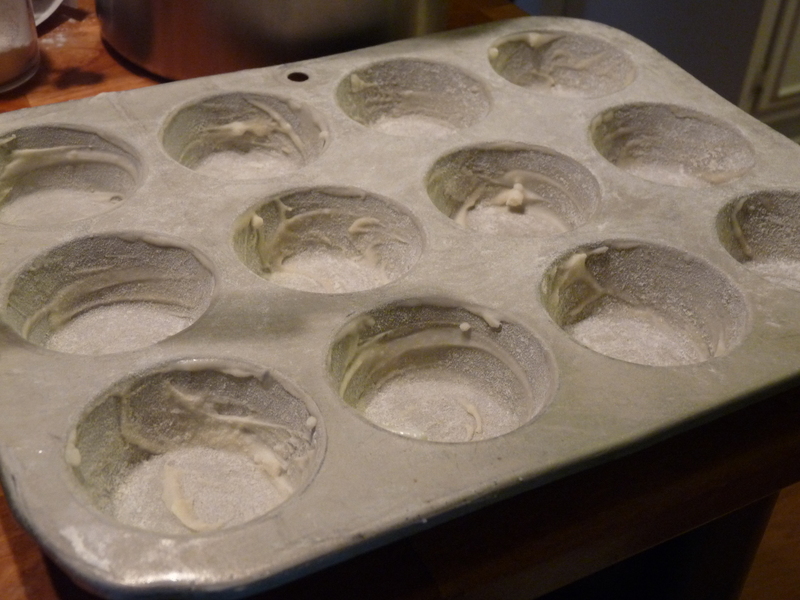 Grease and flour muffin pan or use cupcake papers. As for the hot cocoa mix…you can use any flavor you like, I just grabbed three packages of no–sugar added hot cocoa mix. That gave me roughly 1/2 cup of powder. Filled up the muffin tin about 2/3 full and actually had to prep an extra pan to make a total of 18 muffins. They baked up beautifully! You’ll know they’re done when you lightly touch their tops and they spring back. Preheat oven to 375 degrees. 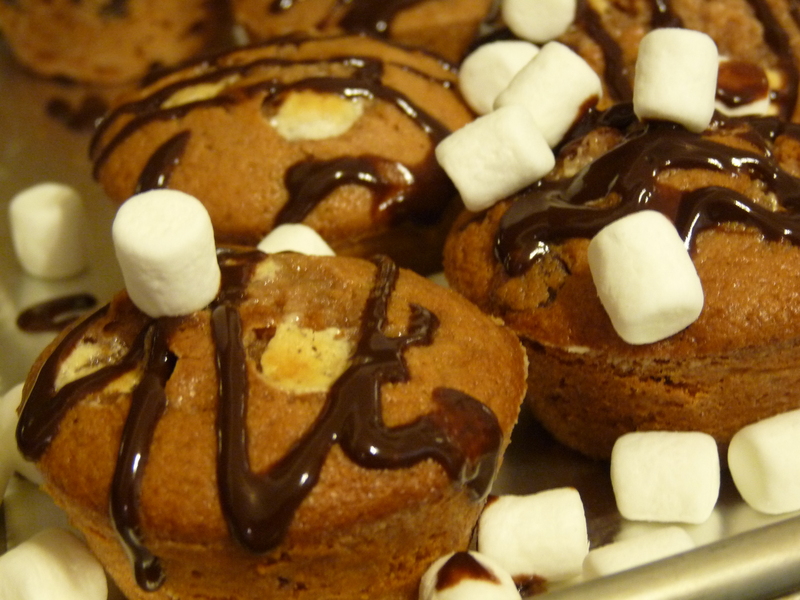 Grease and flour muffin pan or use cupcake papers. Combine dry ingredients, including chocolate chips. Set aside. In a small bowl mix together milk, eggs, vanilla, and melted butter. Pour into dry ingredients and stir till just combined. 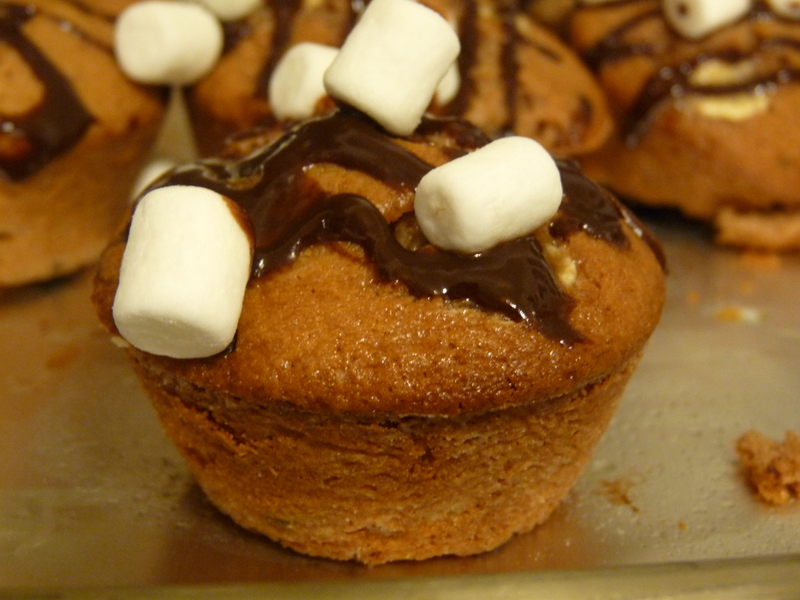 Fill muffin cups and bake for 20 minutes. Muffins will spring back when touched. 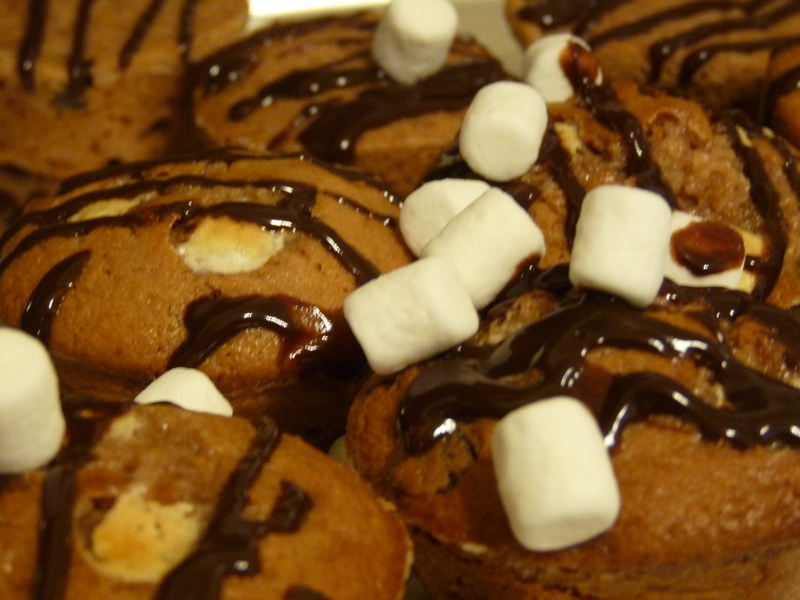 Variation: Press marshmallows into the tops of each unbaked muffin (3–4). Bake normal and drizzle with chocolate glaze. In microwave, melt chocolate chips and butter. Stir to combine, add milk to thin out just enough to drizzle. For an easy drizzle method, pour melted chocolate into one corner of a quart size bag. Squeeze out air and snip a tiny bit off the opposite corner. 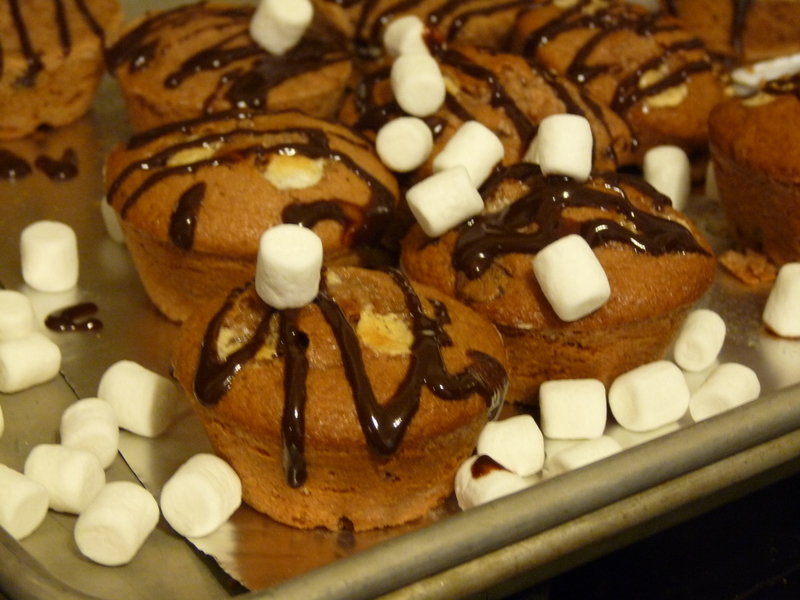 Give the bag a twist and proceed to drizzle back and forth over muffins.